PAT Testing, or portable appliance testing is the term used to describe the examination of electrical appliances and equipment. This is done to ensure they are safe to use, and although they are not a legal requirement in themselves, many insurance companies request this before issuing cover. The UK Health & Safety Executive will expect businesses to comply with current UK legislation and have an annual PAT inspection on all its equipment. Businesses have a legal responsibility to ensure the safety of its employees and the public, and to maintain all its equipment safely. As it isn’t a legal requirement there is no law stating how long you should leave in between testing, but we generally recommend 12 months for most appliances. PAT testing is an inexpensive way to ensure your equipment’s safety, with prices varying between £1.50 and £3 per item. 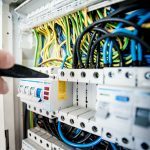 It involves a visual inspection of the appliance and its cable, then the cable is plugged into the tester to check the continuity and insulation of the cable. If everything is compliant and working safely, the appliance will be issued with a sticker stating when its test was and when the next test is due, and most importantly if it has passed or failed. So now you know what PAT testing is, how do you find the right person for the job? The person doing the inspection needs to be competent, trained in PAT testing and have a good electrical knowledge. Ideally, an electrician. Funnily enough….. If you’re based in Doncaster, to talk to us about PAT Testing get in touch.